The Edwards's Pheasant, Lophura edwardsi, is endemic to the bamboo forests of central Vietnam. This bird is named after the French ornithologist Alphonse Milne-Edwards. This pheasant is one of the most endangered of all pheasants with an estimated 1000 to 3000 surviving birds in the wild - mostly of the nominate form. Their diminishing numbers can be explained by hunting, deforestation, and the use of defoliants during the Vietnam War. L. e. hatinhensis - the northern form: has a variable number of white tail feathers / retrices. This difference in the two forms may be due to inbreeding. The northern form is sometimes given a separate species status by some authors. The average length of this pheasant is 23 - 26 inches (58-67 cm). It has red legs and facial skin. 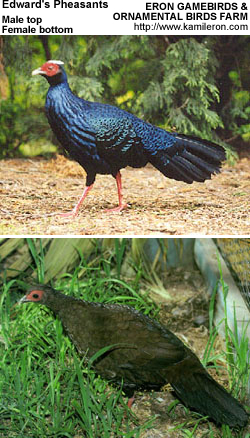 The male is a mainly blue-black with a crest, while the female's plumage is a drab brown. Their alarm call sounds like puk-puk-puk. Fortunately, this critically endangered pheasant is thriving in captivity, where conservation efforts are currently taking place to save this species from extinction. These pheasants require a spacious, well-planted aviary, 39 sq.ft. (12 m2) should suffice - although some have been successfully bred in smaller avaries. A suitable dry shelter should be provided to protect them from the elements. It is recommended to keep them them in pairs. These pheasants are ready to breed the first year. The breeding season, in the U.S., usually starts in May. The female lays 7 to 21 eggs, which she incubates for 25 days. They should be provided a staple food of game bird pellets, seeds, greens and live food.